I've been thinking of how I've had such low self esteem the majority of my life and how I made choices that kept me at that level. I forgot the truth about myself and all women. 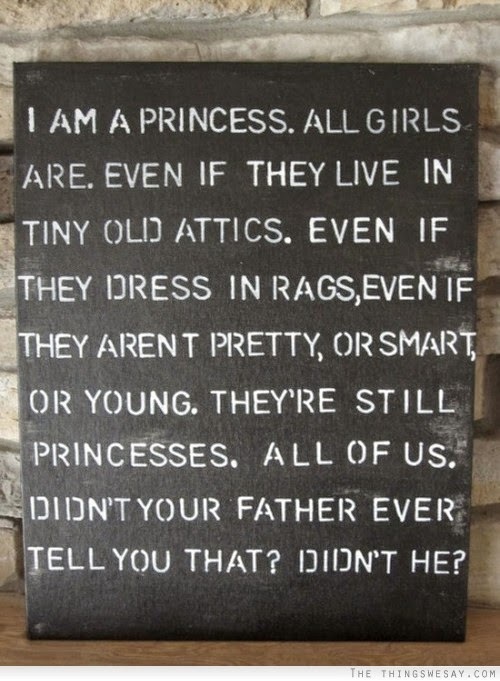 We are all princesses, it doesn't matter if we are young, old, skinny, large, etc. Whatever we are, we are all beautiful in our own way. I had to think about it this way, my two girls are very beautiful to me. When either one tells me they are not, I get upset that they cannot see what I see. I had a bit of an a-ha moment with that, because I haven't always thought I was all that beautiful but I was only thinking of the outside packaging. I don't believe my children are beautiful just because of their looks. I think they are beautiful on the inside, which radiates on the outside. My oldest who is very head strong is beautiful to me because she's strong willed and does not settle for less then what she deserves. She respects herself enough to only want the best, she knows her self worth. That is beautiful to me. My youngest is incredibly thoughtful, she draws me pictures, gives me tons of hugs and she radiates that sweet nature she has inside. She is so kind, so loving and such a chatterbox. I miss her when she's not home, she lights my day up. I have been pondering on this since my youngest told me one day that she couldn't live in a castle because she wasn't a princess yet... I looked at her and I said you are a princess, all girls are princesses and don't ever forget it. She smiled, I tell her this often now, I always want her to remember that. It was around this time that I realized that I believed this for my children but have not always believed this for myself. There was my a-ha moment, if I want my children to know that they are amazing, I have to believe that I am as well... Is this easy? No... it is not easy at all but it's true. If we want the people in our lives to believe how wonderful they are, we have to believe in ourselves. If I want to have positive happy people in my life, I have to be positive and happy. The truth is that whatever you send out comes back to you in equal force, I choose to send out love.